Размер этого PNG-превью для исходного SVG-файла: 720 × 504 пикселей. Другие разрешения: 320 × 224 пикселей | 640 × 448 пикселей | 800 × 560 пикселей | 1024 × 717 пикселей | 1280 × 896 пикселей. 14:11, 15 сентября 2011 720 × 504 (11 Кб) Marcos Elias de Oliveira Júnior Correcting colors of the letters of the motto "Ordem e Progresso" to leave equal to the rest of the green flag. 14:06, 15 сентября 2011 720 × 504 (10 Кб) Marcos Elias de Oliveira Júnior Fixed colors based on the new version of Image:Flag_of_Brazil.svg. 20:37, 15 сентября 2007 720 × 504 (6 Кб) TigerTjäder Straight stars. 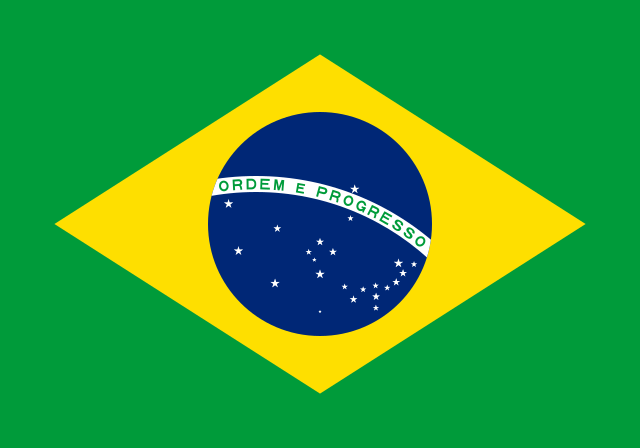 16:40, 13 сентября 2007 900 × 630 (6 Кб) TigerTjäder Based on the new version of Image:Flag_of_Brazil.svg.